Fonk Cape Town - So you need to create an app? So, you need to create an app? We have built a team, a company and an environment designed to increase your idea’s chance of survival. Our team of strategists, designers and developers that know how to create valuable apps. We drive digital businesses forward through our four key services: Think, Design, Build and Care. We believe digital should only exist if it adds value to real life. So before we let the developers loose, we need to have a highly considered concept based on robust and creative thinking. Over time we have created and refined our RockPaperScissors methodology. It is designed to deliver awesome prototypes while always taking your ROI and risk reduction into consideration. This approach is what sets us apart. Design is about clearly articulating a human problem, continuously experimenting with ideas until a simple but profound solution is discovered. This solution not only addresses the problem, but makes those that apply it feel a certain way. These principles are what govern design at Fonk. Because no problem or client is the same, we developed a dynamic design process that can be adjusted with each project without compromising the fundamental design principles. In it, we rigorously iterate through different proposed ideas, test them with the target market and continuously integrate with the development team. At Fonk we take your idea from napkin to the App store(s) using our own refined Agile processes. Custom mobile app development, testing and launching - we take care of everything for you. Through constant feedback loops with all stakeholders, we make sure you know exactly what you are getting and are part of the process every step of the way. What happens post-launch is critical. Quality digital products need to be well looked after. We do this by offering 3 levels of service to best suit your needs. Constant innovation and reaction time are critical to your growing business. Your product needs special, proactive attention to keep you ahead of the rest. 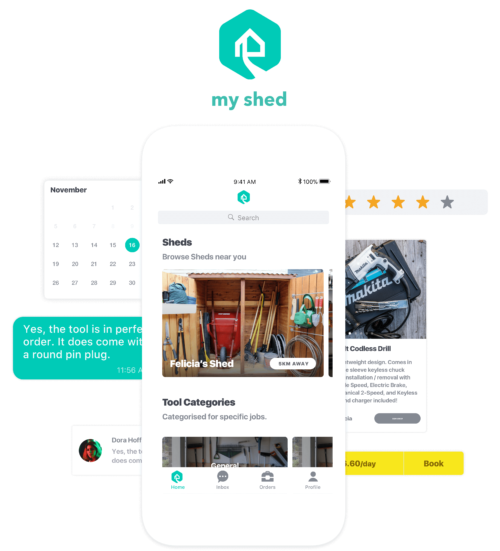 The new way of renting and sharing tools.